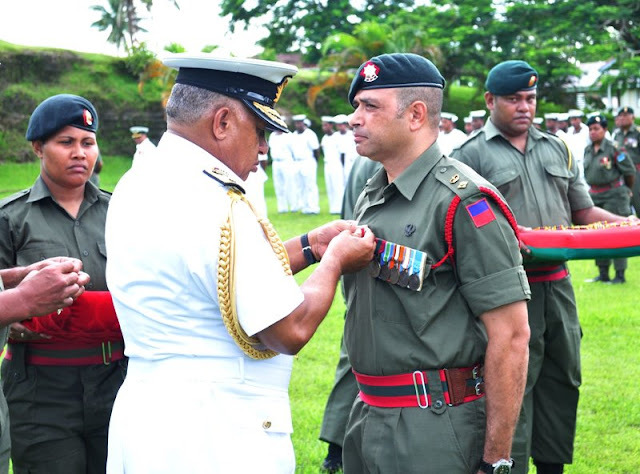 Just days after the release of the photos of CRW soldiers beaten and tortured to death for their role in the 2000 mutiny, Fiji's illegal leader has awarded medals to some of the soldiers who've carried out his dirty deeds. At a medal parade yesterday at Queen Elizabeth barracks, the country's illegal leader (incongrously kitted out in navy whites), awarded the likes of Lieutenant Colonel Sitiveni Qiliho, with the Operational Leadership Award. Qiliho, the CSO for Operations, has been fingered in the torturing and killing of the IFMS soldiers and the torching of the Deuba house of Justice Ward. In a speech aimed at reminding soldiers how good they have it under him (Fiji's soldier's are now some of the best paid in the world thanks to the regime pumping millions into the military budget), Bainimarama yesterday reminded military personnel that their obligation is towards the welfare of their family and the community. It's widely believed Frank Bainimarama intends to cement his power at the elections by becoming prime minister but some insiders maintain his preferred plan is to become president. They believe his only choice is to become president with absolute power as commander-in-chief and to let someone else run his party for the 2014 elections. In what was clearly a pitch for the military to keep backing him, he said: "The new constitution will affirm that there will be no discrimination, no ethnic voting one, and establish the democratic principle of one person, one vote, one value." This moron bainikaiyum doesnt have a power base,,,even the soldiers will not vote for him. The Findians will vote NFP and some Labour and the Fijians SDL which will be backed by the chiefs and methodists as usual. Where does that leave the Bainikayum gang ??? either prison or they out,,,,,,,,the imbeciles must be dreaming so better for them not to hold elections. Watch the people apologising to Voreqe liu muri him when elections come. He is a fool who doesn’t realise he is being taken for a ride by the Fijian villagers. As for Qiliho he is Roko Lui's partner in crime (parties and women) so Bai better watch his front and back. Bai the lialia is also making pre conditions on the constitution talks which renders the process invalid from the start ,,,,what a imbecile! Awarding a buch of petticoat officers who have sided with the interim PM, a bloody murderer and a hypocrite.Remember, a day will come when you will run and hide, but we will hunt you and get you to answer for all your misdeeds. Qiliho was one of the many soldiers that killed those unarmed CRW soldiers he's recieving a medal for it. Bainimarama, you may be currying favour with you soldiers, but its the majority of us who really matter much more. you have violated, suppressed, murdered and deprived us of our dignity, human rights and democracy and nothing will satisfy us than seeing you tried in court and punished accordingly. Yaaaawn. The c&p mode continues. Fresh outta ideas (as usual) in how to inspire loyalty & esprit de corps, he thinks that once again, the medals will do the trick. If Aziz & Driti can turn, so too can Qiliho, Rokoua, Naliva etc. It's called human nature a'la "what's good for the goose is good for the gander". Ratu Sukuna must be turning in his grave - RFMF now awarding citations for torture & murder. And where was Viti's most esteemed & revered No1 bati Nailatikau? They should call it the dictators medal for cowardice and also have a special dictators medal for fastest cassava patch sprint although I doubt Frank's time will ever be beaten. He really is the Usain Bolt of the tavioka patch. Please include in the medal citation the adulterous affairs that what committed in Sinai whilst Qiliho was commanding officer there.What a disgraceful operation leadership award medal recipient,BOCI! Next week they are going to play pin the tail on the pig. Do you have any pictures of soldiers who were killed by the CRW soldiers? VB's slogan - Serve me first. family & communtiy comes last!! Did you ever think of the CRW families when you killed them? CRW curse will follow you to death!! What the investigation on Qiliho for pointing a pistol at one of the QEB Guards ,what has happened to it?Land Force Commander,Suliano,COMD RFMF,answers please,we the serving OR's need answers if it was one of us we would be in civvy street now. one day you all will pay for treason. time to make a mend .go back to the barrach and let civilian run the govt. can frank tell fji public how much debt fiji is in to imf/exim bank of malaysia,china.india. 4.8 billion. also how much pay he gets/minister from aunty bano. did you keep the word of the late president to uphold the 1997 constitution.-no liar. no school idiots.wanna be pm. This idiot is putting on the Rabuka style. The way he speaks and adresses military parades by putting up a brave face. He presents false self confidence by the expression of his face and tries to be looking tough. One will agree he has become a Rabuka copycat over the years. No more the timid cassava patch dasher he once was. Kua soti na viavia vaka-rough-rough tu tamata lamulamu dau sava deck ni waqa o iko. Tamata sega ni kila na vosa vakamatau. Rauti iko la na laki tu ena varada..teri rauti iko na veiliutaki. frank who gave you the mandate to rule fiji. ans the thugs/guns. you have no legal right to change the constitution. the problem you are a lamu sona . afraid to go to jail. fiji is f up by you. tell fijian you have mess fiji with huge debt. also how much cuts you made from china/malay co.
sad day when you will rot with your gun/money in hell. our god will punish your family for this. the sins of the parents will come to the children. Here he rewards bad behaviour ( murderers etc) and the young soldiers are watching. What you do to others will one day be done to you. You Bai better hope that you won't be at the receiving end when these young soldiers take action.They will beat you and your family up and there will be no mercy. Ouch. Qiliho ticks the way he does because he does not know who his father is. He has never experienced the warm and loving environment we were all brought up in. You see his late mother is from Cautata [very unfortunate] and his mother very much later married his now adopted father - Bishop Qiliho. All his Army life he was known as TUKAITURAGA! Bishop Qiliho then later decided to give that same name to him. This is why Siti is still not sure whether he is a Tukaituraga or a Qiliho! He is still not sure whether he is a kai Cautata or a kai loma. He is till not sure whether he is a kai Nadroga or not. Lots of good comments here. I especially liked 'Usain Bolt of the tavioka patch'. Also, the truth that what goes around, comes around, and the observation that this impromptu medal ceremony really shows how insecure Bainimarama is feeling after Roko Ului's release of the suppressed BOI report. The Commander's Special Commendation for Treason medal will be quite an albatross around the neck after the Hibiscus Revolution. One of the commenters quite rightly pointed with concern to the large debt with which Bainimarama is saddling the nation in his efforts to buy personal popularity. I'm a fiscal conservative who believes in promptly repaying debts, but I propose that when (not if) Fijians restore democratic government, the new government should repudiate all debts amassed by the Bainimarama regime. Debts rolled over from earlier administrations should be honored, but any and all loans initiated under Bainimarama should not be. This would be a just and proportionate rebuke of those co-enablers of the regime. It would be a cautionary example for any entity contemplating loans to illegal regimes in the future. And it would dramatically lower the debt burden on the children of Free Fiji. Wadan Narsey, as our future Minister for Finance, what do you think? Fiji would incur the wrath of its new Chinese and other creditors, but Fiji's traditional friends -- who are larger donor countries anyway -- would certainly be sympathetic and, I daresay, generous, especially since Fiji would still honor its earlier debts. Even Beijing will swallow its hurt in order to avoid losing its new influence in this part of the world. The more widespread the sentiment for repudiation of Bainimarama's debts, the harder it will be for this regime to ply the financial markets. So, 'repudiate the debt'! Pass it on. See the female soldier holding the medals,she has attended any courses ,has just recently joined the RFMF,maybe 3 years now and she is a Sergeant,whilst moston parade watching have spent 15 - 20 years but a still Privates.What a shame Sgt Rabuka maybe the 'Tailevu' connection. Dua na siga! E sa tu e vei oqo o Driti kei ira na kena vo? Dua na siga e na luva na i sulu o darava tiko 'qori! O na mate vaka taki Saddam!! sorry ..couldn't get that right...a medal for what?bravery in battle?more like for a@#s kissin? There is no war hero for the medal parade but murders. All these promotions in the forces. Are they on merit? Have these 'commissioned' officers completed degrees and presented thesis and graduated from officer academies? Or, is it a just a matter of waving a 'magic' wand! What shambles! Oh dear!! What wars have these criminals and murders fought to deserve these tinpot medals? hahahahaaaaaaaa! The BOI report into the 2000 coup has revealed the type of officers, organisation and leadership the FMF is. Naivalurua should stop preaching leadership to Police officers.